[Photo: Par 5 10th. Putt from back of green]. On 16 I got down in two, and on 18 I had another 30 yarder. And if you don’t hit the right line your ball could simply fall off the green. This is an ‘uber’ exclusive club. It falls alongside the Old Head and K Club. Like the Old Head it is relaxed and friendly, despite the posh atmosphere. True, lots of Americans call this club ‘home’, but far more Irish corporates are now hearing the call. The Lodge, or clubhouse to you and me, is visible from a long way off as it consists of many attractively stoned buildings that include apartments and lodges. 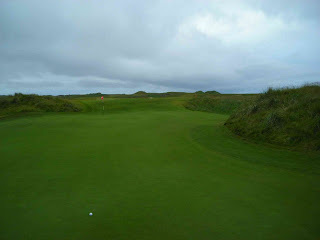 When I arrived in the evening I wasn’t overwhelmed, but it grew on me, and by the time I arrived on the 1st tee the following morning I was raring to go. Mind you, that might have had something to do with all the dope I’d smoked the night before with the surfer dudes at the beach car park. The club didn’t want me (my camper van) too close to the clubhouse, so I was sent off to a nearby beach where all the surfers hung out. 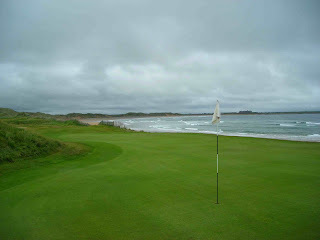 Golf started and ended in the rain, but between 2 and 16 it was a breezy and overcast day and perfect for links golf. 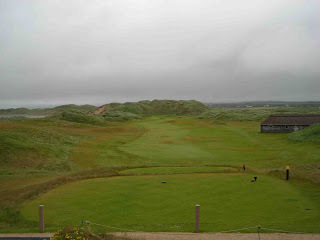 Doonbeg is an interesting creation. Time and again you have no idea what to hit and while I wouldn’t be a fan of taking a caddy, if you’re any good and you want to score/play well, I’d suggest you get one. The Starter, Bryan, gave me a good talking to on the 1st tee, telling me what holes to watch out for, when not to hit my driver, and how to avoid the bunker that sits in the middle of the 12th green. All very useful advice. There is plenty of beauty here and considering that Greg Norman wasn’t allowed to utilise some of the best dunes of all (a Special Conservation area, which the club treats very seriously), he has created many attractive and intriguing holes. You’ll fork out a couple of hundred Euro, but you do get free tees, markers and pitch repairers on the 1st. Probably not €200s worth, but as a marketing man I know how powerful the word FREE can be.